In 1984, after much lobbying and hard work by local agencies, volunteers and departments, Sandy Point officially became a National Wildlife Refuge created specifically for the protection of the Leatherback Sea Turtle (scientific name: Dermochelys coriacea) (the first refuge created for sea turtles), and is managed by the US Fish and Wildlife Service. The recognition of the special significance of this southwestern tip of St. Croix as a major leatherback nesting ground within US jurisdiction was due to work that had been going on by dedicated people for years. Protecting this gentle giant of the seas that found Sandy Point to be the best nesting beach in the region took a lot of hard work and ingenuity. 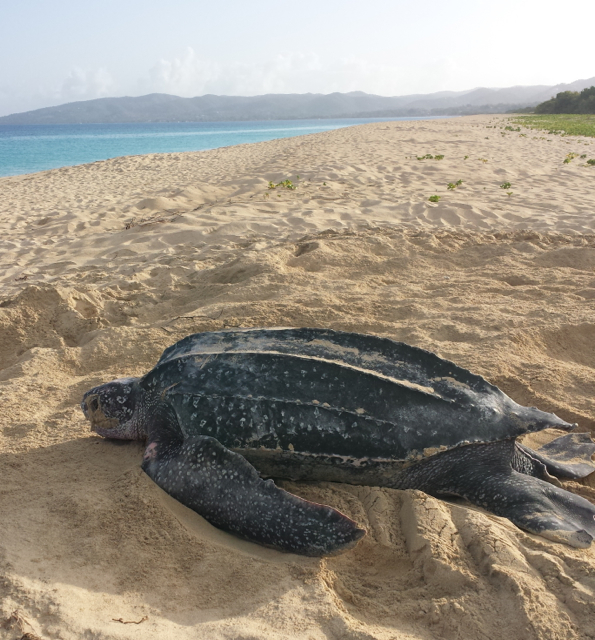 Many people, even today, may not realize that Sandy Point, on this beautiful island of St. Croix, is like a mythical and wondrous sea turtle nesting beach to sea turtle biologists all over the world because of the leatherback turtle. There is nowhere like it. In the early days, friends and family of the late Mr. Otto Tranberg and others began going to Sandy Point to protect the nesting females and to protect their nests. In 1981, the VI Division of Fish and Wildlife began tagging the nesting females with special metal flipper tags that identified those individuals with a specific number. Now they had a way of following individuals through the years, recording how many nests they laid each year, how many years they took off between nesting seasons, how many eggs they laid, and how many hatchlings they produced. The rich history of those nesting females is now preserved forever and we are always making new discoveries from the long-term dataset, even as we add to it every year. A freshly emerged hatchling makes its way to the water from the nest area at Sandy Point. Here are some of the amazing things we’ve learned about leatherbacks at Sandy Point – turtles nesting here sometimes head over to St. Kitts, Puerto Rico, Culebra, Vieques, St. Maarten, Anguilla, and other islands within and between seasons – some females have twin hatchlings and these are genetically identical – leatherbacks can dive to deeper than 1,000 METERS! – each turtle has a uniquely-shaped pink spot on the top of its head that can be used to identify it – the longest time a single leatherback has been recorded nesting at Sandy Point is 32 years – the age at which a hatchling will come back as a mature adult to nest is between 9 and 12 years – there can be multiple dads for each nest, usually one dad but often two dads – and many other amazing finds! A vintage project photograph showing the unique pink spot on top of the turtle’s head. The tag number here is VI1183. She nested 8 times in 1987! Twelfth Day! Follow our Turtles!